Warmer temperatures and declining snow are making it tougher to host the games. In mid-January, just three weeks before the opening this week of the Winter Olympics in Pyeongchang, South Korea, the women’s World Cup speed races in the Austrian Alps were struggling to get underway. Heavy rain and mild temperatures had degraded snow on the Karnten-Franz Klammer course, making conditions unsafe. “It’s a difficult situation right now with the way the snow is and how they prepared the course,” American downhill skier Lindsay Vonn told the Associated Press. “I am not sure if we are going to be able to get the race off.” The races had to be postponed for a few days. It’s no surprise for climate researchers that training for the Winter Olympics, and the games themselves, have run into trouble. For sports contests that rely on snow and ice, a warmer global climate is no friend. 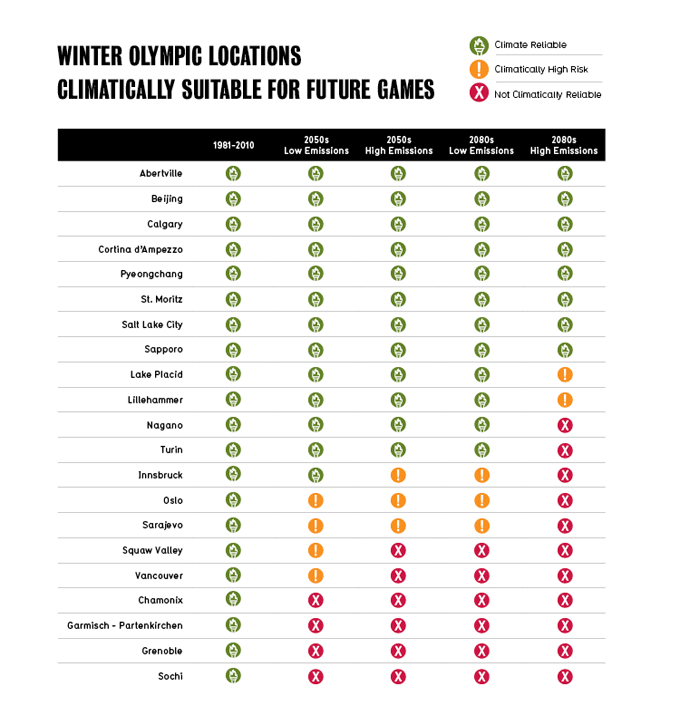 The same week in January that Women’s Cup races stalled, the University of Waterloo in Ontario, Canada, released a study concluding that climate change is increasingly threatening the viability of the Winter Olympics, held once every four years. The study released January 11 was actually an update to one published four years ago, which predicted (correctly) that weather and snow conditions would be a challenge at the 2014 Winter Olympics at Sochi, Russia. During those games, a number of practices were canceled and athletes complained about unsafe conditions. The updated study, which includes contributions from Canadian, Austrian, and Chinese researchers, concludes that if global greenhouse gas emissions are not dramatically reduced, only eight of the 21 cities that have previously hosted the Winter Olympics will be cold enough to host them by the end of the century. Even if the goals set by the Paris Agreement in 2015 are achieved, only 12 of the 21 cities would be suitable by the late 21st century. Innsbruck, Oslo, Sarajevo, Squaw Valley, Vancouver, Chamonix, Garmisch-Partenkirchen, Grenoble and Sochi – all part of Winter Olympics history – would no longer be on the list. Average temperatures have jumped from just under 33 degrees F for Winter Olympics held from the 1920s to the 1950s, to more than 37 degrees for games held during the 1960s and 70s, to more than 46 degrees for games held since 2000. The trend is expected to bring still-warmer average temperatures for the winter games. Average February temperatures in past host locations are expected to warm up another 3.42 to 3.78 degrees by mid-century, and 4.86 to 7.92 degrees by late in the century, according to the study. 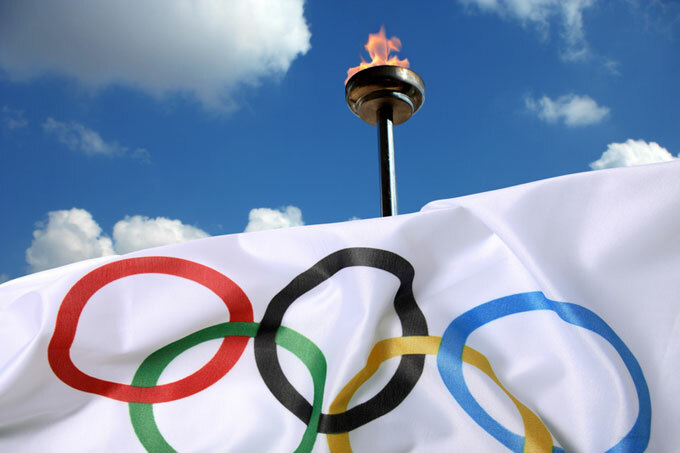 One bright note: The two cities added for the updated study – Pyeongchang in South Korea, the host of this year’s games, and Beijing, the host of the games in 2022 – are expected to remain cold even under high-emission scenarios. At this year’s games, on February 7 and 8, scientists and educators are to meet for the first PyeongChang Forum on the Earth and its Citizens to discuss climate change and other environmental topics. Organizers hope the new event will create a valuable ongoing forum to discuss the globe’s environmental challenges and prospects for increased environmental sustainability. A warming climate is not just affecting the Winter Olympics themselves. Training for the games has become complicated by increasing temperatures, with athletes traveling farther and more often to reach places where there’s still enough snow and ice. Glaciers in Austria, the Italian Alps, the French Alps and Canada have deteriorated so much that athletes must travel farther and farther to train. French snowboarder Pierre Vaultier recognizes the irony of adding to carbon emissions by traveling to colder locations because global carbon emissions have led to melting glaciers. “We are not examples about how to decrease global warming,” he told the AP. Protect Our Winters, an advocacy group based in Boulder, Colorado, and founded by snowboarder Jeremy Jones, works to raise awareness about the impact of climate change on winter sports and recreation. The group isn’t involved in any particular awareness campaign tied to this year’s Olympic Games, but it should be obvious to spectators that the warm weather is posing problems, says Lindsay Bourgoine, POW’s manager of advocacy and campaigns, in an interview with Yale Climate Connections. “For me it’s an ideal opportunity to really connect with a broader spectrum of people, and to bring them into the fold to think about the consequences in their own lifetimes and how they can take positive action,” Bourgoine says. In recent years, a broader spectrum of outdoor enthusiasts have connected with POW to voice their concerns about climate change. They’ve included fly fishermen, paddlers, rock climbers, mountain bikers and others – not just skiers and snowboarders, Bourgoine says. Protect our Winters has advocated for carbon pricing policies around the country, and it’s brought professional winter athletes to meet with lawmakers in Washington D.C. Last fall, Jones testified before the House Committee on Energy & Commerce to discuss the broad impact of warming on outdoor sports. Back in late 2012, POW and the Natural Resources Defense Council published a study that reported the impacts of climate change on the nation’s $12.2 billion winter tourism industry – an industry that generates more than 560,000 jobs and $8.8 billion in federal and state taxes. With carbon emissions unchecked, winter temperatures could warm up to 10 degrees Fahrenheit by the end of the century, resulting in decreases in snow cover area and snowfall, and a shorter snow season, the study said. Snow depths could decline in the West by 25 to 100 percent. A dry and warm season this winter in the West has been tough on the winter sports industry in Utah, New Mexico, Colorado, and California. With end-of-century climate projections predicting ever more warmer winters, there will be fewer reliably cold seasons not just for Winter Olympic athletes and professional sports competitors today – but for tomorrow’s athletes: kids.